Last week we discussed the decision to pull the British troops out of Boston following the Boston Massacre, as well as the repeal of most of the Townshend Duties. These pullbacks ushered in several years of relative calm, from the end of 1770 until the end of 1773 when the Tea Party broke the peace once again. Of course, those years were not entirely trouble free. Today I want to cover the Regulator movement in the Carolinas. I find the political evolution of South Carolina and North Caroline particularly fascinating. In both cases settlers of the western part of the colony tended to be German, Scotch, or Irish, as compared to the English who settled along the east coast. However, when the Revolution broke out, the western North Carolina settlers tended to support the patriot cause while easterners tended to maintain stronger support for the king. In South Carolina the opposite happened. Easterners joined the patriot cause, while westerners tended to remain loyal to the king. I have not paid much attention to South Carolina since Episode 15, when the British crushed the Cherokee Uprising of 1761. After the Cherokee gave up a large amount of territory to settle that dispute, colonial settlers moved in and set up farms. Although parts of what is known as the Piedmont region of the colony had white colonists who had already lived there for a generation or two, the 1760’s saw a period of substantial growth. Land settlement came quickly, but government in the new settlements did not keep up with the population boom. This led to what we call the Regulator movement. South Carolina Regulators were generally farmers and men of property who lived in the western part of the State. These new settlers primarily, were not South Carolinians moving west. Rather they were immigrants moving into the colony. South Carolina had a Governor and Council appointed by the King. The colonists elected a House of Commons, although property requirements greatly limited voting to a relatively small minority of planters. Elected officials had even more stringent requirements. Members had to own 500 acres of land or more, at least 10 slaves or equivalent property, and belong to the Anglican Church. Most of the western settlers were not Anglicans. They were recent immigrants from Western Pennsylvania, Virginia, and North Carolina. Their families tended to be German, Scotch-Irish, or Welsh. As in England, the colonial legislature did not see any need to redistrict on a regular basis. So even the few men who might qualify to vote, did not have any representation in Charleston. The Piedmont region also had no sheriffs, courts, or jails to maintain law and order. The local property owners formed themselves into vigilante groups, known as Regulators, which enforced their view of law. Mostly, they targeted what they called hunters. These were essentially homeless people with guns. They roamed the back country, killing animals, often farm animals. They left half eaten carcasses, which attracted wolves and other undesirable wildlife. They would sometimes start fires to chase game at night. They often wandered into Indian reserves, potentially stirring up another war. Sometimes they would steal directly from farmers or even raid isolated farms. There are stories of some brutal home invasions during this time. The Regulators first organized to drive these undesirables out of the area. Regulators would go after anyone believed to be guilty of a crime or other undesirable behavior. If a suspect was captured, the Regulators would most commonly dispensed punishment with a whipping, sometimes with a demand that the accused leave the area. Property owners who did something to displease the Regulators might find their barn or home burned to the ground. Even suspected prostitutes were subjected to whippings as the regulators attempted to make their territory more respectable. Regulators also had to deal with escaped slaves. The Regulators tended to be wealthy property owners, many of whom owned slaves. The communities of ruffians living in the back country often provided asylum to escaped slaves which not only made it easier for slaves to escape, but created a core that might eventually organize into a slave rebellion. The Regulators operated for most of the 1760s, providing the only source of law, frontier justice for the region. But even the Regulators wanted a more official and permanent form of law enforcement. They lobbied the Governor and assembly for influence in the government. They wanted representation to put in place a more legitimate and stable government in the west. In 1768, the government obliged by creating new Judicial Districts for the western regions. It also organized new electoral districts. Finally, after elections, the western districts sent representatives to the legislature in Charleston in 1770. By then it was pointless. I mentioned a few episodes back, after the legislature sent money to John Wilkes in 1769, the Governor prevented the legislature from appropriating any more funds, and in 1771, the Governor stopped all legislation. So, the 1770 victory got the westerners representation in a legislature that could not pass any legislation, yay! Even so, the creation of judicial districts, along with sheriffs and courts, largely put an end to the Regulator movement in South Carolina. Landowners could still serve as posses when the sheriff needed them, but law enforcement system was at least administered by government officials. Despite bringing the westerners into colonial politics, the east coast elites and the back country Regulators remained divided in many ways, religious, social, and cultural. When the eastern colonists largely joined in the rebellion against Britain a few years later, the inland groups tended to join the Loyalist side and fought with the British when the war came to South Carolina. The North Carolina Regulators evolved in a very different way. If South Carolina Regulators complained about not enough government, the North Carolina Regulators complained about too much, or at least too corrupt. Settlers in the western parts of North Carolina came from similar backgrounds as their western South Carolina neighbors. They also encountered some of the same fundamental differences from those controlling the colony along the east coast. Like its southern neighbor, North Carolina had a crown appointed Governor and Council, as well as an elected legislature. Voting was limited to free men of property and districting strongly favored those living along the coast. The eastern dominated colonial government appointed tax collectors, sheriffs, and judges to administer the inland counties. Now I know it’s hard to believe today, but in the mid-1700’s North Carolina often had corrupt local officials who harassed and ripped off the residents. The tax system was bad enough. The colony had a poll tax, which unlike an income or property tax, meant that every person paid the same amount. It did not matter if you were a subsistence dirt farmer or a plantation owner with 10,000 acres. As you might guess, such a system was particularly tough on the poor. Government officials earned a living by going out and extracting money from tax delinquents by any means necessary. Some had a nasty habit of collecting a tax, then “losing” the paperwork and demanding they pay a second time. Another big problem was the lack of cash in the economy. As I discussed in earlier episodes, the lack of gold and silver in the colonies caused serious economic problems. Some colonies had tried to circulate paper money, but London usually did not allow that. In North Carolina, especially in the west, most people operated on a barter system, with very little cash circulating. Keeping money in your home was actually dangerous as it made you a target for theft. Taxes, however, had to be paid in gold or silver. If a taxpayer did not have enough ready cash when the tax man came around, the tax collector would put a distrain on the property, effectively seizing it. The tax collector received fee for doing so, and therefore had every incentive not to give the taxpayer any time to come up with the cash. Within days, the state would sell the owner’s property, usually at a cut price to a friend of the tax collector, who again collected a fee for his work on the tax sale. Collectors also added fees if they had to visit the home of a taxpayer who did not show up to pay taxes at a designated time and place. Tax collectors often would not give much of any notice when they would arrive. Often, colonists would find the original tax bill to be only a small portion of the total fees added to their bill. Some locals attempted to take the tax collectors to court. But the tax collector was the local sheriff or deputy. He often colluded with judges and lawyers to extract even more court fees and legal costs before finding against the taxpayer anyway. Westerners did not have many political options either. Local citizens held town meetings and sent petitions to the Governor for reform, but these all seemed to fall on deaf ears. Like South Carolina, North Carolina apportioned most of its representatives in the east, meaning the westerners were very underrepresented in the legislature. For example, two western counties contained 6000 people and had four representatives. At the same time, five small counties along the coast had a total of less than 2000 people and had 25 representatives. Although they had some representatives, they did not have enough to convince the legislature to initiate any sort of reform. In 1764 William Tryon arrived as the new Lt. Governor. Tryon was a British military officer with close ties to the top of London’s power elite. His wife had been maid of honor to Queen Charlotte. She was also a family friend of Lord Hillsborough, the Secretary of State, who appointed him as Lt. Governor. Tryon became Governor when his predecessor died the following year. One of his first controversies came with the Stamp Act protests of 1765-66. His strong support for the Act and its enforcement made him enemies throughout the colony. After the Stamp tax repeal in 1766, the Governor tried to reduce tensions and rebuild relationships in a customarily North Carolina way: he held a barbecue. He roasted three whole oxen, brought in wagon loads of beer and bread and invited just about the whole colony to attend. Many people came, but they were not ready to make nice. They protested by taking the food and beer and dumping it on the ground or in the river. A massive fight ensued which included a relative of the Governor’s wife being killed in a duel. This incident poisoned any chance of a good relationship between the Governor and the colonists. The following year, he made things worse by demanding £20,000 to build a Governor’s Palace for himself. 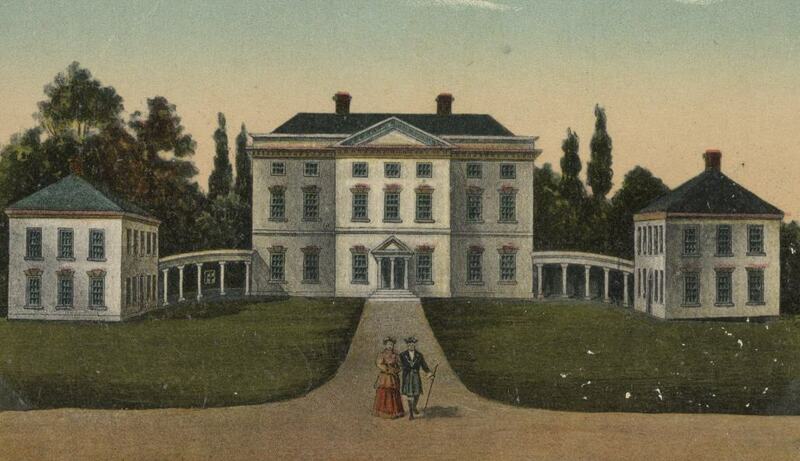 For many taxpayers, especially in the west “Tryon’s Palace” was the final straw. Rather than reforming the burdensome and corrupt tax system, the Governor was adding a huge new expense that would result in even higher taxes. To protest the corrupt system of tax collection, the citizens of Orange County refused to pay any of their taxes in 1768. Instead, they gave it to their representative in the legislature, Harmon Husband (sometimes Herman Husbands). When the Assembly met, the Governor demanded to know why no one had paid taxes. Husband threw a bag of gold and silver on the table and told the Governor that he had all the taxes. He was prepared to pay the treasury in exchange for a receipt showing the taxes had been paid. Husband announced that he had acted as tax collector to keep much of it from "disappearing," as always seemed to happen. In response, the Governor had Husband arrested and thrown in jail. He released him several days later after learning that 2000 Regulators were advancing on the jail to free him by force. Not wanting to have an organized political force against him, the Governor divided Orange County into three separate counties. He also forced through legislation prohibiting the sale of gunpowder or shot to anyone in those three counties until further notice. With the Government refusing to consider any reforms, the Regulators simply shut down the government in the western counties. Armed militia prevented any sheriffs, tax collectors, or judges from operating. One particular target of the Regulators was a man named Edmund Fanning, a friend of the Governor, responsible for tax collection in Orange County, and also sheriff of Hillsborough. Fanning was the personification of the corrupt tax collector for the Regulators. He had also built up large land holdings in the area, much of it from land sold at tax sales. In 1770, in what became known as the Hillsborough Riot, Regulators shut down the local court, seized Fanning and another lawyer, and beat the men. They ran Fanning out of town, paraded an effigy of him through the streets, and damaged his home and other property. Essentially the demands of the regulators were twofold and quite reasonable. First, they wanted to put an end to the corrupt local government that was cheating them out of their property. Second, they wanted a reapportionment of the legislature, which currently benefitted the east. Tryon was not ready to make peace with troublemakers. Rather than compromise, he got the legislature to pass the Riot Act of 1771. The Act effectively redefined protest as treason. It made it a felony for 10 or more people to assemble after being warned to disperse. It exempted officials from prosecution for the murder or injury of any rioters. Any accused rioters who did not submit to arrest within 60 days were declared outlaws, who could be shot on site. It also permitted the government to seize and sell any of their property. Although the law would expire after one year, they made it retroactive to prosecute rioters from earlier events. Finally, the law authorized the Governor to raise a militia at public expense to execute the new policies. In March 1771, Gov. Tryon assembled a 1000 man militia and marched them into the heart of the Regulator country. The two sides played a game of cat and mouse for several months. Finally, in May, the two sides formed for a showdown. The judges in Hillsborough informed the Governor that they could not hold a court session due to the Regulators. Gov. Tryon assembled a militia of over 1000 officers and men to move on Hillsborough and protect the court. Another militia force of about 300 under Gen. Hugh Waddell advanced on Hillsborough from another direction. The Regulators blocked Wadell’s advance, and captured part of his supply train, including ammunition. Tryon moved his larger force to join with Wadell and confront the Regulators. 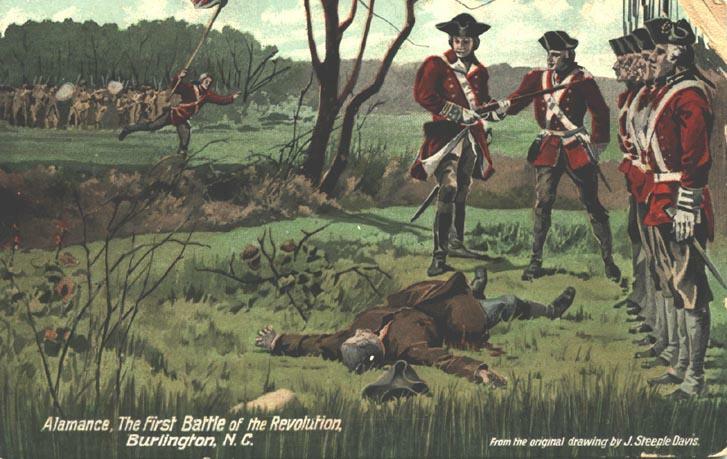 The two groups met near Alamance Creek on May 16, 1771. By most estimates, the Regulators had about 2000 men under arms, well outnumbering the militia. But Gov. Tryon was a professional officer by training, and also had several artillery pieces with him. By contrast, the Regulators did not have any officers in overall command. They were far too disorganized to make effective use of their numbers. By some accounts, the militia were reluctant to fire on the Regulators who were in many cases their friends and neighbors. 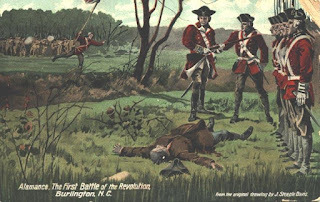 Tryon, however, ordered them to fire, at one point allegedly saying “fire on them or on me!” The militia engaged the regulators in a heated battle lasting several hours. Some stories say that many regulators fought until they ran out of ammunition, then simply got up and went home. The Regulator lines broke and the militia spent much of the battle chasing down Regulators through the woods. In the end, Gov. Tryon and his militia controlled the field and completely dispersed the Regulators. The militia reported nine dead and 61 wounded. The number of Regulators killed and wounded is not reported in any official records. Some reports indicate they also lost a similar number of killed and wounded. Others report the Regulators took as many as 300 killed and wounded. The militia captured only 15 prisoners, one of whom they hanged that evening. The following day, Governor offered amnesty for most of the Regulators, as long as they agreed to end their resistance and swear loyalty to the colony. Eventually, more than 6000 people took advantage of this, taking an oath of allegiance and receiving pardon. 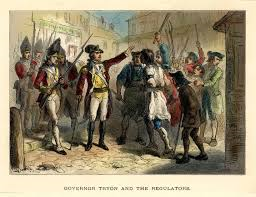 Tryon did not give amnesty to the leaders of the revolt though. He tried twelve leaders under the Riot Act, and hanged six of them. Many Regulators took their families and left the colony shortly thereafter. Among those leaving the colony was Harmon Husband, who had led the political opposition to the governor and was with the regulators shortly before the battle of Alamance. As a Quaker, he did not participate in the fighting. Even so, as a leader of the resistance, he decided his time in North Carolina was over. Husband fled to Maryland and eventually settled in what became western Pennsylvania, around Pittsburgh. He wrote an account of the Regulator movement, which unfortunately, I cannot find in an available electronic format. As a pacifist, Husband sat out the Revolution, but would have one more act near the end of his life as a leader in the Whiskey Rebellion in the 1790s. London generally credited Tryon with his firm and successful termination of back country resistance. Later that year, Hillsborough promoted him to Governor of New York and he headed north, taking Fanning along with him as his personal secretary. His successor, Governor Martin, tried a radical new approach and actually investigated the complaints of corruption in the western counties. He instituted some reforms, and even prosecuted a few corrupt local officials. Some historians say the Battle of Alamance Creek should be considered the first battle of the Revolutionary War. I am not convinced that is a fair characterization. The Regulator war did not involve the British Army. The regulators continued to profess loyalty to the King and British rule. Their dispute was more about local internal colonial corruption, not British taxes or trade. Still, the Regulator movement stands as evidence that Americans throughout the continent would stand up and fight for their rights, with guns if necessary. Next Week: Rhode Island colonists attack and sink a Navy Ship, the HMS Gaspee. Basset, John “The Regulators of North Carolina (1765-1771)” from Annual Report of the American Historical Association, 1894, pp. 141-212. Fitch, William Some neglected history of North Carolina; being an account of the revolution of the regulators and of the battle of Alamance, the first battle of the American Revolution, New York, Neal Publishing, 1905. Otis, James With the regulators. A story of North Carolina in 1768, New York: A.L. Burt Co. 1901 (story based on the NC Regulator events). McCorkle, Lutie Andrews Was Alamance the first battle of the Revolution? Raleigh: E.M. Uzzell & Co., 1903. Stockard, Sallie Walker The history of Alamance, Raleigh: Capital Printing, 1900. Brown, Richard M. The South Carolina Regulators, Cambridge: Belknap Press, 1963. Kars, Marjoleine Breaking Loose Together: The Regulator Rebellion in Pre-Revolutionary North Carolina, Chapel Hill: Univ. of North Carolina Press, 2002. Klein, Rachel N. Unification of a Slave State: The Rise of the Planter Class in the South Carolina Backcountry, 1760-1808, Chapel Hill: Univ of North Carolina Press, 1990. Nash, Gary The Unknown American Revolution, New York: Viking, 2005. Troxler, Carole W. Farming Dissenters: The Regulator Movement in Piedmont North Carolina, North Carolina Office of Archives and History, 2011.